Extensively illustrated and evidence based, Movement System Impairment Syndromes of the Extremities, Cervical and Thoracic Spines helps you effectively diagnose and manage musculoskeletal pain. It discusses diagnostic categories and their associated muscle and movement imbalances, and makes recommendations for treatment. Also covered is the examination itself, plus exercise principles, specific corrective exercises, and the modification of functional activities. Case studies provide examples of clinical reasoning, and a companion Evolve website includes video clips of tests and procedures. 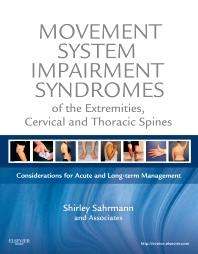 Written and edited by the leading experts on muscle and movement, Shirley Sahrmann and associates, this book is a companion to the popular Diagnosis and Treatment of Movement Impairment Syndromes. An organized and structured method helps you make sound decisions in analyzing the mechanical cause of movement impairment syndromes, determining the contributing factors, and planning a strategy for management. Detailed, yet clear explanations of examination, exercise principles, specific corrective exercises, and modification of functional activities for case management provide the tools you need to identify movement imbalances, establish the relevant diagnosis, and develop the corrective exercise prescription. Case studies illustrate the clinical reasoning used in managing musculoskeletal pain. Evidence-based research supports the procedures covered in the text. Over 360 full-color illustrations -- plus tables and summary boxes -- highlight essential concepts and procedures. A companion Evolve website includes video clips demonstrating the tests and procedures and printable grids from the book.